I really like how this one turned out. 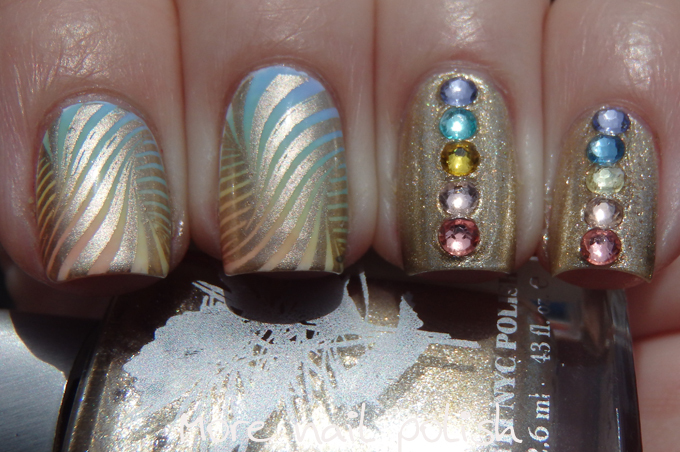 It's definitely a 'me' mani in that it's my two favourite colours in one mani, rainbow and gold. 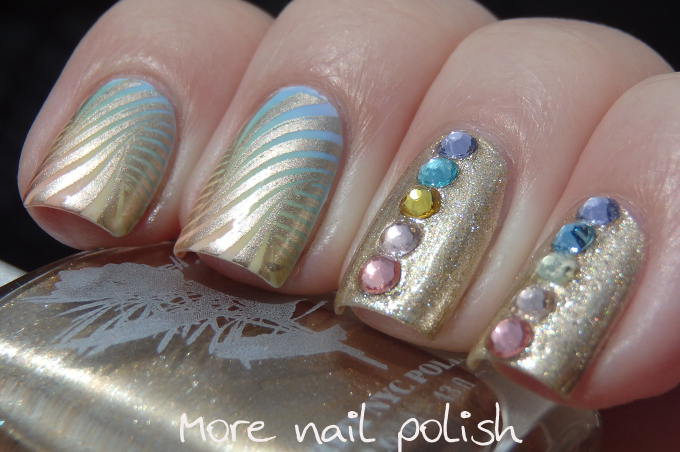 I do did a soft pastel diagonal gradient on my thumb, index and middle fingers and then stamped with Essie Good as Gold and JR-04 plate from MyOnlineShop. 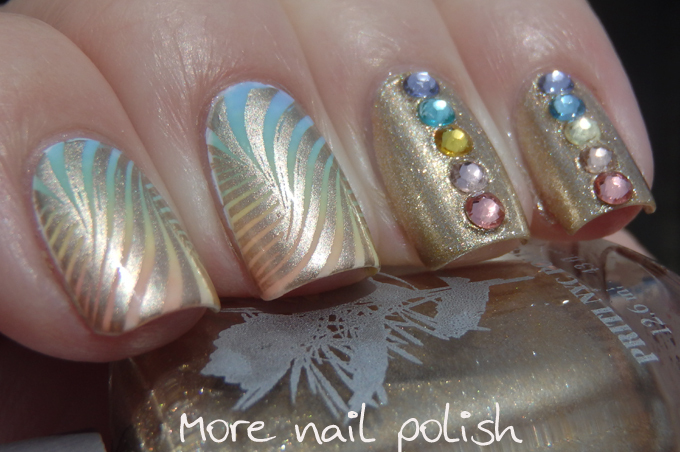 On my ring and pinky I used Priti NYC Chrysanthos and then placed pastel coloured Swarovski crystals down the nails. The only thing that is irritating me about this is that damn bright yellow crystal in the middle of my ring finger. I swear I don't do my nails in the dark at night, but this is now the third time that I have carefully picked out crystals that I thought matched in colour when I did my nails at night, only to look at them in the day light and discover they don't match at all. It's annoyed me for the last time though, cause last night I bought 10 of those empty circular nail wheel thingos so I can sort out my mixed bag of crystals into groups of the same colour. I just need to make sure I do it in the sunlight! 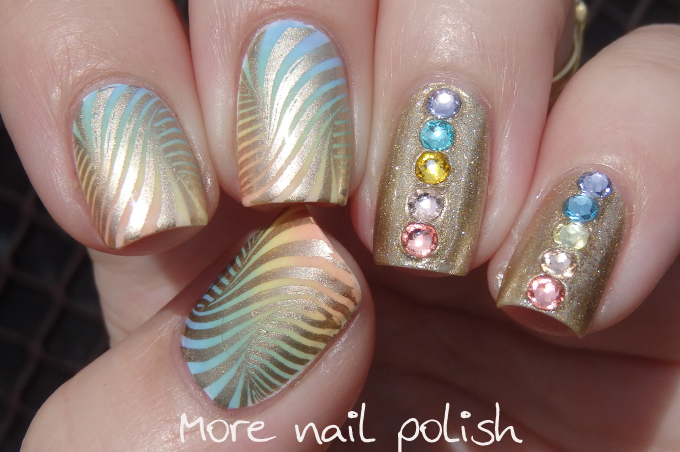 This so pretty, I love the colours you have used! Very pretty. 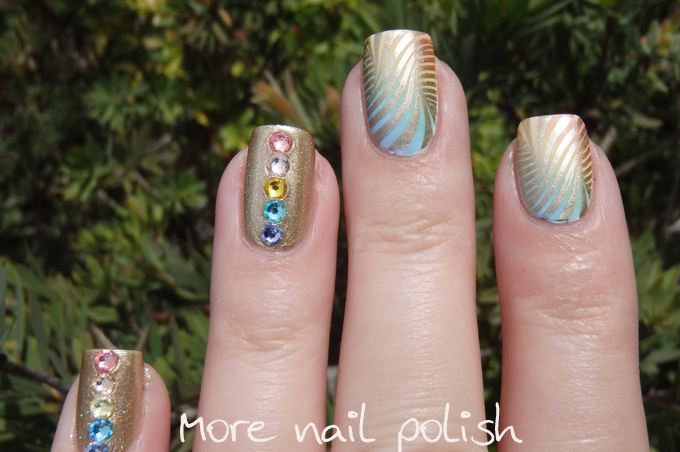 I love the gold swirly wavy design and the little colored rhinestones work so well and bring our the gradient rainbow base on the stamped nails. Cute!